In the past half a decade, global rare earth metals market has been witnessing a turbulent state of affairs, with costs of rare earths going through the roof. An instance of the turmoil in this space can be aptly credited to China’s monopoly in rare earth production. Though short-lived, China’s extensive reduction of export quotas of rare earth metals (REMs) a few years earlier, had sent ripples of panic across the globe that eventually called for developing mines outside China, a hostile superpower in global rare earth metals market. According to reports, China plays host to about a third of the world’s documented rare earth reserves, with 70% of the worldwide light rare earth metals (REMs) coming solely from the Bayan Obo mining deposit in Inner Mongolia. The overwhelming presence of China in the global rare earth metals industry share, clearly depicts the country’s considerable influence over the business – a fact that has encouraged many international users to look for secondary options than completely relying on China’s low-priced rare earths, especially the US military. For the record, U.S. military technologies, right from bomb manufacturing to missile guidance systems are heavily dependent upon rare earth metals supplied by China, consequently emerging as one of the biggest victims of China’s monopoly. It has been reported that, to make U.S. completely independent of the rare earths supply chain, it could take at least 15 years to wean the country off the foreign dependency. However, several experts speculate China’s monopoly to be precisely contestable, as the rest of the world is aggressively rolling up its sleeves and ramping up production in an attempt to diversify the supply chain portfolio. The recent approval given by Australia’s Northern Territory Environmental Protection Authority (EPA) for the Australian rare earth mine, for instance significantly validates the rapidly growing market outside China’s monopoly in rare earth minerals. Further elaborating on this bulletin, this prospective rare earth mine, with an operating life of 30 to 35 years, is estimated to have the potential to supply to around 10% of the worldwide demand for praseodymium and neodymium. Sources further reveal that, the authorities are planning to mine over 5 million tons annually, and produce 65,000 tons of ROM (run-of-mine) ore from the mine when in operation by 2020. Experts deem this move to have a remarkable impact on the regional rare earth metals industry trends, as the ore will be used to produce NdPr oxide, which is highly used in manufacturing high-performance permanent magnets. Speaking of which, it is prudent to mention that these magnets, being pivotally essentially of electric and hybrid vehicles, are used extensively in the automotive and electronics industry. Rare earth metals – a set of 17 chemical elements in the periodic table, have been witnessing significant demand right from the manufacturing of battery cells for laptops & smart phones to hybrid & electric vehicles and wind turbines for power generation. The table below outlines in brief the broad application spectrum of some of the very popular rare earth metals. Rare-earth magnets used in high-power electric motors, components of hardware, lasers, etc. Rare-earth magnets, used in hard disk drives lasers, core material for carbon arc lighting, additive in didymium glass used in welding goggles, etc. Optical fibers, additive in mercury-vapor lamps, light aluminum-scandium alloy for aerospace components, ceramics, etc. NiMH battery, high refractive index glass, rechargeable batteries, battery electrodes, fluid catalytic cracking catalyst for oil refineries, etc. Rare-earth magnets for hard disk drives, lighter vehicles & improved performance, lasers, etc. Neodymium and dysprosium, two of the most widely used rare earth metals, find extensive application in manufacturing highly efficient magnets that are used as green energy products in the battery materials space. There is no denying the fact that the automotive industry in China has been the largest, if measured by automobile unit production since 2008. This fact sheds light on the significant demand for REMs within the country for manufacturing green energy products, further highlighting China’s monopoly in rare earth minerals. However, it is crucial to understand that, though used in green energy application, these critical rare earths are more than mere commodities and are therefore at a risk of exhaustion. In response to this fact, in tandem with the potential bottlenecks in the supply chains of certain metals, several rare earth metals industries are seeking to reduce their reliance on these metals. Despite the growing interest in harnessing rare earths as green energy products, quite ironically, there are many environmental and health issues associated with the production and processing of REMs. On that note, it is important to know that the byproducts of mining rare earths are usually waste products that negatively impact the environment. Further elaborating on the environmental impact of rare earth mining, reliable reports enlist the potential negative effects of REMs as waste rock stockpiles, metal deposition, and sedimentations. In addition, several independent studies claim that rare earth metals industry experiences a global ecological fallout, chiefly because of its hazardous implications on environment. With Baotou, Inner Mongolia, encompassing the maximum number of REM processing plants, China’s monopoly in this business space can be aptly justified through the region’s expansive supply chain. However, the region has also been affected due to this humongous availability that has also had a tumultuous environmental impact due to rare earth mining. Elaborating further on the subject of China’s rare earth metals pollution, the nation’s State Council’s spokesperson reported that the robust growth in the regional rare earth metals industry has significantly triggered surface vegetation damage, pollution, soil erosion, and reduced food crop output, since these rare earths plants produce waste water with a high concentration of radioactive residues. Taking into account the extensive proportion of rare earth mining in China, environmentalists are emphasizing on following industrial ecological principles, through which recycling and reuse of these materials can provide a means to mitigate the environmental and social conflicts that have arisen due to the pollution by China’s rare earth metal mining operations. Considering that industry analysts anticipate the world consumption of rare earth metals, exclusive of China’s monopoly in this market, to be around 75,000 metric tons a year from 2013 to 2018, the REM quota hardly seems sufficient to assert the green energy growth. China, on other hand, is estimated to solely produce around 100,300 metric tons. Keeping their view on this crucial rare earth metals market dynamics and the environmental impact on of rare earth mining, experts fear the so-called rare earth metals to unfortunately live up to their name. As the percentage of rare earth mining operations increase, several rare earth metal companies are expanding their global reach to mitigate supply chain bottlenecks, while others are focusing on developing alternative materials that may eventually eliminate the use of REMs. Toshiba Corporation, for instance, has been involved in developing a high-iron concentration samarium-cobalt magnet that can be used in motors. Reports claim this to be a promising development in the quest for alternative materials to replace REMs, which would eventually eliminate the environmental impact of rare earth mining. Another notable instance is that of ReNew Rare Earth Inc., a start-up operating in U.S. rare earth metals market, that developed significant alternative to REMs by using conventional chemical processes. According to reliable sources, this unique chemical process developed by this company can handle a range of industrial materials including thermal insulation materials, magnets, phosphors, and capacitor materials. Projects of such statures clearly depict the proportion of efforts undertaken at a global scale to suppress the environmental impact of rare earth mining. It is also imperative to note that in the event such projects succeed, China’s monopoly in the REM supply chain may be drastically reduced. Significant price fluctuations and inconsistencies in the demand & supply of rare earth metals is one of the important factors leading to rare earth metals market volatility. However, when it comes to changing market dynamics, it is quite overt that the magnitude of China’s rare earths production plays a crucial role in setting up new trends. In fact, it wouldn’t be wrong to say that, with China at its epicenter, the global rare earth metals market has witnessed a major flux in its price trends. According to reports, China accounts for majority of the market share, and has been identified as sole producer of 90% to 95% of rare earth metals, which clearly depicts its monopolistic grip. However, in 2011, China announced a 35% reduction in the export quota for raw rare earth metal ores, apparently on account of the excessively negative environmental impact of rare earth mining, in addition to maintain its strategic dominance at par. However, as China being a major producer and exporter of the rare metals, it eventually became difficult for other countries to be dependent on China for REM demands, which led to significant price fluctuations in the global rare earth metals industry. This speculative bubble burst of 2011 has been marked as a significant landmark in the history of rare earth metals market. Experts further speculate this rapid price escalation and export restrictions to have served as a wake-up call to regional government bodies that had been complacent prior to China’s announcement. Amidst the backdrop of this scenario, to balance the global trade activities, several rare earth metals market players had commenced mining activities outside of China. One emerging contender to pose a challenge to China’s monopoly was Lynas Corporation Limited, that started its new production unit of REM in Australia. Reports claim that Lynas is now the largest but the only producer of rare earths, and arguably, the only major producer outside China. Another major rare earth mine to go on board in the US rare earth metals industry was Mountain Pass Rare Earth Mine, then owned by Molycorp Inc., which soon filed for bankruptcy in 2015. Nonetheless, the country has set the re-opening of the Mountain pass as its strategic goal, further aiming to sabotage China’s monopoly. Considering the current scenario across this business sphere, several companies have been working to open rare earth mines through collaborations and governmental support. In wouldn’t be wrong to quote that the global rare earth metals market has significantly strengthened in recent years, as new supplies have hit the business sphere and exports from China are back from the brink. It can be concluded that, with such new sources of supply on board, recycling and minimum REM usage being implemented, and alternative solutions being developed, the worldwide rare earth metals industry is poised to attain lucrative gains in the ensuing years. 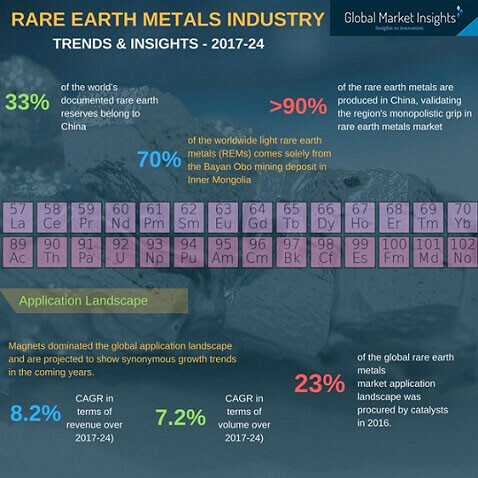 Validating the forecast, a study report published by Global Market Insights, Inc., projects rare earth metals market to raise a valuation of USD 20 billion by 2024, with an annual growth rate of 9% over 2017-2024.